Why people are unhappy with Will Smith as Genie in live action Aladdin. We have our first look at Will Smith as Genie in Aladdin and... something is very wrong. There are few things that get me more excited than a live-action remake of a Disney classic. I’m a 26-year-old child, what can I say? 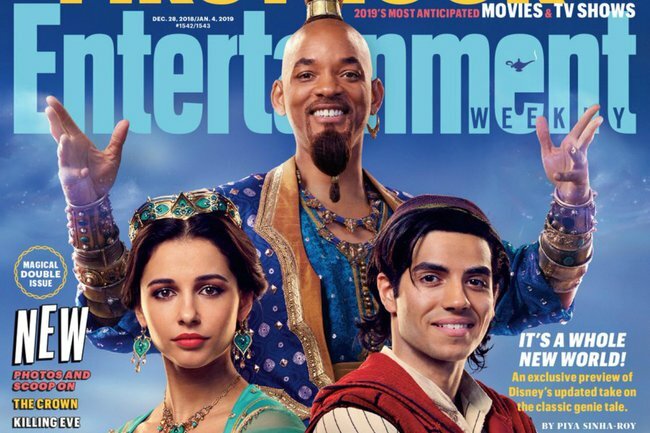 Entertainment Weekly shared its cover showing Jasmine and Aladdin, played by Naomi Scott and Mena Massoud, and Will Smith as Genie. And that is where there was a bit of a problem. Obviously Will Smith has big shoes to fill – the late Robin Williams was truly iconic as the fast-talking, hilarious and loveable Genie in the animated film. Speaking to EW, Smith acknowledged the “terrifying” prospect of following in Williams’ footsteps but said he decided to infuse the character with his personality, just as Williams had done. “I started to feel confident that I could deliver something that was an homage to Robin Williams but was musically different,” he said. And while it’s fair enough that Smith wanted to put his own stamp on the character, there was one glaring issue that Twitter could not ignore. Why the heck is Will Smith’s genie not blue? The genie is supposed to be blue. Couldn’t they find a real blue person to play the genie? The panic was short lived, thankfully, as Smith clarified that a few hours later that he would in fact be blue.